I want to begin by acknowledging Karl Stolley’s call to action that we “hold our colleagues and students accountable for their technological choices just as they would be held accountable for any other rhetorical choice.” I want to begin with this acknowledgement because I think this is one of the things our roundtable is about. My particular choices related to digital methods have been largely informed by two things: bad luck and paranoia. I mention these services and tools because my past experiences inform my present methods, most of which now involve paid services. I use NewsBlur for my RSS feeds, Pinboard for my bookmarking needs, and Posthaven for online writing. NewsBlur and Pinboard are both run by single individuals and a two-person team is responsible for Posthaven. I have only good things to say about them. I value these services and what I do with them enough to pay for them. I don’t have a high opinion of free, and I’m not alone. The Atlantic’s Alan Jacobs suggests some companies offer their online services for free so they don’t have to provide real support for users. 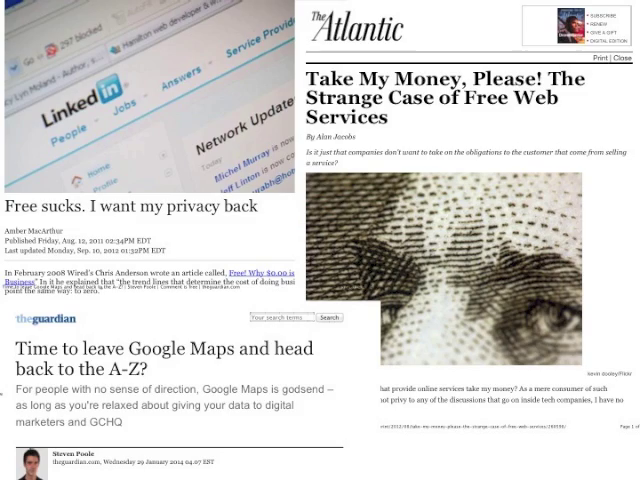 The Globe and Mail’s Amber MacArthur observes how “free is proving to be a serious threat to our privacy.” The Guardian’s Steven Poole notes that “we obediently conduct our own self-surveillance and voluntarily upload the data to companies who profit from it.” So, while Jacobs notes a lack of company responsibility when it comes to free services and tools, MacArthur and Poole connect ideas of free to privacy and surveillance. I’m concerned about the influence of surveillance on our digital methods. I even worry about using services and tools that contribute to the normalization of surveillance and the surveillance of normalcy. Such worry informs why I still prefer handwritten drafts and print books and journals over digital and online versions. In keeping at least some of my everyday methods offline, no one else can lay any claim to them. Marginal notes are my own, not kept in the cloud. Article drafts are my own, not data-mined for targeted advertising. I realize these choices in digital methods could paint me as a privileged academic flush with cash, or a paranoid delusional with a tinfoil hat. I don’t think I’m necessarily either of these. I’d just like us to value what we do enough to pay for it, to not leave ourselves and our work vulnerable to the whims of tech companies who depend on the allure of free. A step toward such valuing might involve department and program funding and support for website hosting and premium accounts at independent online services, or maybe just a specific stipend devoted to the development and maintenance of digital methods. Perhaps some departments and programs already have such funding in place. If so, I’m heartened to know there are others who value and hold accountable our technological choices, just as I know my roundtable colleagues do.